I've never had a really cute beach coverup. I've always worn an A-tank and shorts to the beach while other girls will wear pretty dresses. When I was younger, my mom will tell you that I refused to wear dresses at any cost, but nowadays I like dressing up, even if it's just to the beach. I have a few summer dresses in my closet, including this amazing maxi dress I bought at the Gap at the end of last season, but I don't have any dresses I can wear over a bathing suit. Enter the beauty of Pinterest. Next to my To Make board, My DIY and Craft board is my favorite pinboard on Pinterest. It has only a few projects, mostly for my future apartment - and later house - but one I had pinned about a month ago is something that is perfect for this time of year. The pools are open (except for mine), people are taking trips to the beach, and again I am in desperate need of a pretty coverup. After much backtracking (which unfortunately, is something I do not like about Pinterest) I found the original site that contained a tutorial on how to make this cute little coverup. I am not one for sewing, except for the minor sewing I have done on crochet projects, but when I saw this wrap I knew it was something I could put together. Plus, this Pinterest Challenge I found on Topsy Turvy was a perfect excuse to sit down and put this project together for the blog! 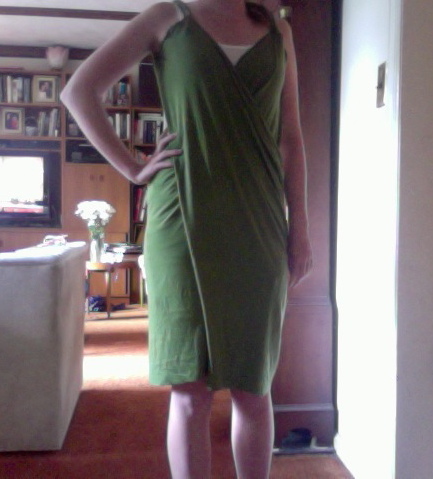 I took my first trip to Joann Fabrics, bought some stretchy green fabric, and got to work. Before you go to the store, you need to determine how much fabric you need. I'm a 0/2, and I needed 2 yards (6 ft) of fabric. Basically, you need to take your hip measurement and double it. And when in doubt, buy more than you think you'll need. Remember, you'll need some fabric for the straps as well. Head out to your local fabric store (bring your coupons!) and look for a "Jersey knit." This is a spandex/polyester blend that stretches, but not too much. You want a fabric that will be clingy in all of the right places, where a full cotton blend will just fall flat. Next, head up to the desk to get your fabric cut. Now, when I bought the fabric it was folded over the spool, which meant that even though I bought 1 yard, I actually ended up with 2. 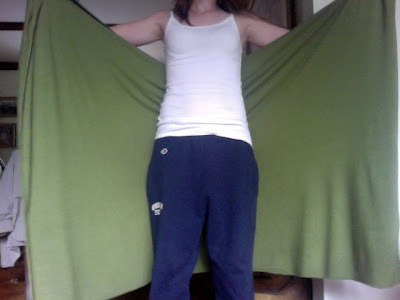 Also, be sure to hold the fabric up to you to make sure the width will cover you appropriately. The fabric I bought has a 58" width, which was plenty for my 5'2" stature. 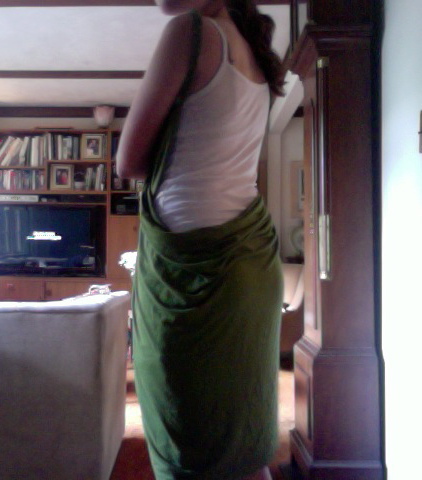 and wrap it around 1 side of your body making sure to bring the fabric to your shoulder blade. 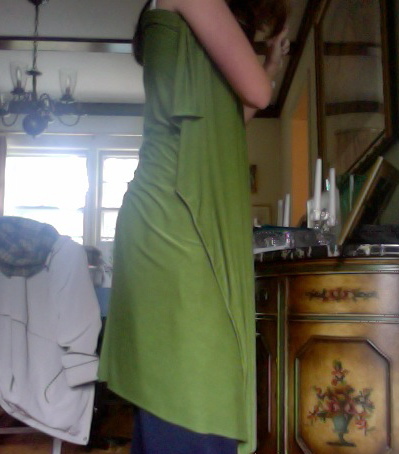 Do the same for the other side (see how the fabric is just about at my shoulder blade in the back?). Trim the fabric if needed on both the sides and the bottom. 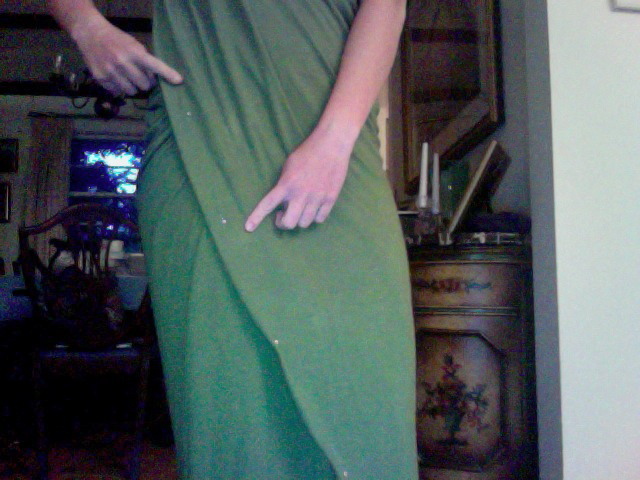 Then, cut out the fabric for your straps. You want 2 strips, 5 inches wide and 1 yard long (you won't need all of that, but it helps to have extra). Cut the 5 inch straps into three smaller straps for the braid. Knot them together and braid, then knot the end. Make sure you make the braids tight since they will be holding up the coverup! Do the same for the other 3 pieces. Set aside. Next, cut an opening for your underarm. Fold the fabric in half (hamburger style!) and cut a C in the top corner (not where the fold is). Then, pin the straps to each end of the C and try it on. Adjust the straps accordingly. 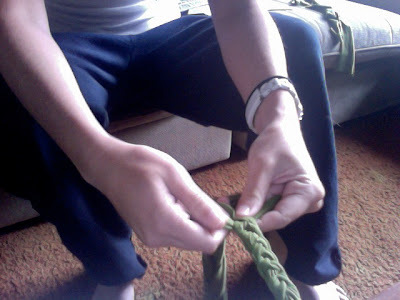 Then grab your thread, cut a length, loop it through the eye of the needle, double it up, and tie the ends together. You want to start and end your sewing on the inside of the dress. Now try it on! Hold the coverup in front of you, put your right arm through, wrap it around in front, behind and then in front of your body again. Put your left arm through. Admire. Do you want to take more off of the bottom? Do you want to angle the front? Or do you love it as is? To make adjustments, I stood in front of a full length mirror and adjusted the fabric and pinned it where I wanted it to fall, then I'd sew and cut as needed. To angle the front, fold under the fabric that's going in front of your body so you have a diagonal line from one armpit to the opposite knee. Pin where you want it to land and then go back and cut. This step isn't necessary, though, so don't fret over it too much. The coverup is lovely as is :) Also, I know this coverup is somewhat daring because the back is completely open, but remember, it's a coverup, you'll be wearing a bathing suit underneath. This is such a cute and modern coverup. I love it so much. And it only cost me $10 to make (with my coupon!) and about an hour's worth of my time (maybe not even!). Plus, this coverup is ridiculously easy to create, so please don't get discouraged by the sewing! You don't need to hem anything either since the jersey material rolls at the edges, hiding any sides you may have cut unevenly. And as always, if you have any questions be sure to leave a comment below! Thank you again to Topsy Turvy for motivating me to finally make the coverup with this Pinterest challenge! 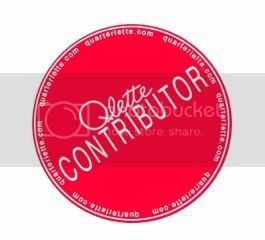 Also, if you like this project, please share it using the buttons below! Happy pinning and beachgoing! OMG!! This is amazing! 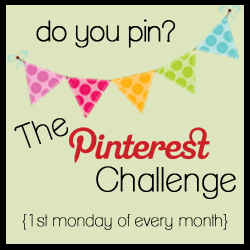 Thanks for sharing and participating in The Pinterest Challenge. This sewing project rocks!! Of course! Thanks for hosting and stopping by! I am totally impressed!!! I'm going to remember this for one of those summer days when my daughter says "I'm so boooored". I'll whip this out and I will be a hero!! Great job, and BTW, I love the color you chose! Thank you! I love this color, it goes with everything! Great Idea...I found you on the Pinterst Challenge. Can't wait to make one.